Kutvek Kit Graphik specializes in the production of custom graphics kits for maxiscooter. From 2005 our product, original and creative, conceived and made in France stay one of the best on the market. Distinguished by their great quality, our decals coat perfectly the cowls of your maxiscooters and give them a unique look. 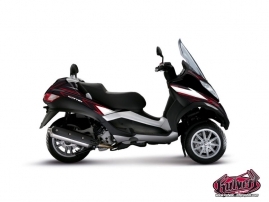 Our designs Energy, Cooper or Velocity enhance the appearance of such a popular model of maxiscooter as Yamaha Tmax 530. To go further and let your Tmax 530 get an absolutely standout style choose our custom graphics kit : share with us your ideas and we will apply them to create the top-quality exclusive stickers. • The colours keep their depth and radiance longtime. • The graphics kit of Kutvek is very resistant to all kinds of outdoor impact (water, frictions, UV rays). • The solidity is the keyword for our vinyl stickers : they protect the bodywork over many years of driving. 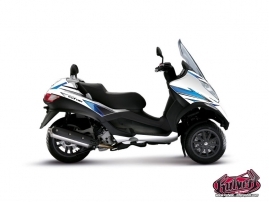 We have developped our products for the flagship models of maxiscooter like Piaggio MP3, Yamaha Xmax, Yamaha Tmax 500 et T max 530. 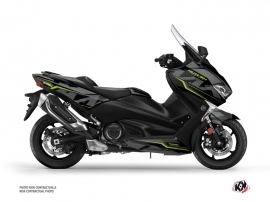 So go on and choose between our collections your dream design and order your scooter stickers. However, if you wish the full customisation of your maxiscooter, please check our 100% Custom option. So if you are looking for the special and compelling scooter accessories, the best solution is to personnalize the aspect of your maxiscooter with our custom stickers and to enlighten your daily life with its intense and bright colours.